It's not possible to create new threads in this forum. No need to add your eBay ads here. 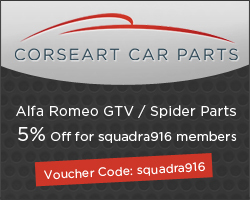 We are updating this forum with all GTV & Spider related eBay ads every 30 minutes. ALFA ROMEO GTV .VERY GOOD FOR YEAR...RELISTED GENUINE BUYER ERROR..NO RESERVE! Alfa Romeo Spider 16V Twin Spark Convertible in Red - with Tax and MOT. alfa romeo gtv 2.0""16 valve.twin spark. shiny red ""sporty car "bargain""